For MP3 downloads we use Payloadz. Their payment system is different than the shopping cart used on the rest of this website. It is recommended that you complete any other pending purchases before purchasing an MP3 download. This conference is challenging, motivational, and practical. Hundreds of Christian moms have been encouraged by these teachings and they are sure to bless you as well! Don’t miss Kathleen Nelson, mother of eight, as she shares what God has taught her along her journey of motherhood. There are 6 audio sessions with a total of nearly 7 1/2 hours of mothering input. A pdf of the conference handouts is included. 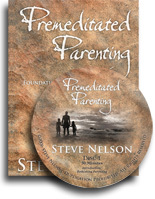 Covering a vast array of Christian parenting basics, “Premeditated Parenting” is essential for parents who desire to raise children who have a passion for God and a heart for people. This audio book is filled with touching stories, biblical wisdom, and practical application. Whether you need foundational advice or just a little encouragement, this audio will inspire you!